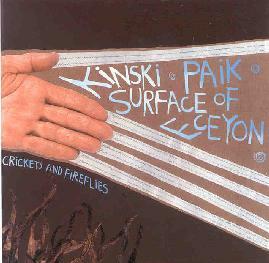 Kinski/Paik/Surface Of Eceyon - "Crickets And Fireflies"
This split from three space/drone rock bands from across the US may be an excellent introduction to each, but also stands on it’s own as a fine release. Each band explores similar territory, crossing over but not replicating the sounds of the others for a satisfying mingling of tuneful magic. Seattle’s Kinski gets things going with the 20-minute mind-blaster Keep Clear of Me, I Am Maneuvering With Difficulty. Starting things off slow and moody, with faint drones, scratches of guitar, and softly buzzing electronics, things start picking up at about the 8 ½-minute mark, as the guitar scratches become monstrous guitar scrapes, shredding the atmosphere like a buzz saw out of control, joined by crashing drums and thumping bass in a stormy, shrieking jam, before it all plunges into near symphonic drone bliss at the end. How do you follow that up? How about with Detroit’s Paik, offering up two tracks. First is the 13-minute feedback dream of Spanish Holiday, with beautiful, melodic, reverbed guitar leads that float through lovely, deep, waves of sonic energy, building slowly into a vaporous cloud of noisy tranquillity. And if you think “noisy” and “tranquility” don’t go together, you may be pleasantly surprised. Eva is a shorter, gentler piece, that still manages to utilize plenty of hazy noise and a slowly repeating riff that drifts along like a broken clock catching up on its ticking every few seconds. And last, but certainly not least, is Surface of Ecyeon’s contribution, the massive, nearly half-hour long Concert of Stars. Recorded early on, before the sessions that produced their debut album, this is pure Surface, a dream-like excursion that certainly lends its mood to the title of the split. One can imagine lying in a field of dark grasses, beneath an endlessly starry sky. Around you, symphonies of crickets play their music, while the soft lights of fireflies mirror the stars above. Drift away. The compositions on this split suit each other exceedingly well, with complementing and contrasting moods that make for a near perfect mix of sonic pleasure. Highly recommended! For more info on Kinski, visit their web site at: http://www.kinski.net. For more info on Paik, visit: http://www.beyonderrecords.com. For more info on Surface of Eceyon, visit their web site at: http://www.surfaceofeceon.com. The Music Fellowship web site is at: http://www.musicfellowship.com. Contact via snail mail c/o The Music Fellowship; PO Box 9325; New Haven, CT 06533.